Pennsylvania has some very unique characteristics to it. The Keystone State has two major metropolitan areas; the one in the East is Philadelphia, and the other in the West is Pittsburgh. Neither is the state capital because that happens to be in the center of the state: Harrisburg. Pennsylvania is known for its coal industry but it is also a major center for financial services. The state has a rich history of labor relations, with collective bargaining sessions that center on employee benefits. It is only natural that Pennsylvania workers are keenly aware of what benefits are offered by their employer. Those cannot be just window-dressing; the benefits have to have value. A comprehensive group legal plan provides the kind of assistance employees can certainly use. People need help in dealing with legal issues that crop up. These are not just cases in front of the small claims court bench, but also wills and medical power of attorney documents. This is why folks recognize that prepaid group legal plan benefits provide the kind of help they need. A plan that has a network of qualified attorneys will be able to provide assistance in consumer protection matters, and also reviewing legal documents. 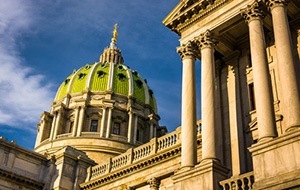 These are part of the legal benefits that Countrywide Pre-Paid Legal Services has provided since 1987 for employers in the state of Pennsylvania. We do not just design plans for major corporations. Union and nonprofit organizations, as well as associations are also part of our client base. The Countrywide plan includes benefits for all of the employees no matter who they are. The same courtesy and respect is provided by every Countrywide attorney. These legal professionals live in Pennsylvania. In fact, they are in the same community as a plan member. It means the attorneys understand the workings of local public agencies and the courts. They provide the kind of support that helps solve problems. Countrywide allows for an unlimited number of telephone calls on a given situation. The lawyers are also more than willing to write letters and make telephone calls on behalf of a plan member. That person’s legal problem is thought of as a priority issue. Countrywide attorneys don’t make people wait for results. Employer/employee matters are not covered, and Countrywide designs a benefit that provides a form of prepaid group legal plan services that covers a lot of bases. Having to deal with problems such as immigration papers or property disputes can be agonizing nightmares for an ordinary individual. The Prepaid Legal Protector Plan provides peace of mind that is so eagerly sought by anyone having to wade through the processes and procedures that are required by the court system. Countrywide wants to make it easier and does all is possible to make that happen. Whether they are in the coal mines of Allegheny County or the loading docks of the Philadelphia harbor, Pennsylvania boasts some of the best employees that a company could possibly want. The work ethic of these people is the reason why Pennsylvania has one of the largest Gross State Product (GSP) in the nation. Employers can show their appreciation for such dedication with excellent employee benefits. Countrywide Pre-Paid Legal Services is proud to provide group legal plans to all of the companies and organizations that call Pennsylvania the home base. We offer the very best because Pennsylvania employees deserve it. We work hard to provide the kind of prepaid group legal plans they expect to have. Employers can give their hardworking employees a benefit that really takes a load off of their shoulders. Please do feel free to call us and we will gladly explain all we can do for you.